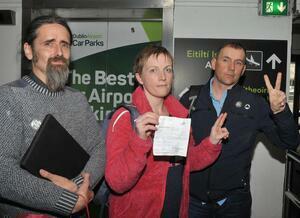 Luke Ming Flanagan (left) and Gino Kenny flank Vera Twomey at Dublin Airport in April after she obtained medicinal cannabis for her daughter Ava in Barcelona. Vera, her husband Paul and Ava are now living in Holland. Vera Twomey and family have been forced to leave Ireland and Gino Kenny’s Medicinal Cannabis Bill has been thrown out of the Dáil. There’s something amiss! The system is failing to even look after itself. Political parties like Fine Gael, Fianna Fáil and Sinn Féin have a great reputation for surviving. Their first instinct has always been to ensure that they do not introduce something that will jeopardise their power base. But now they have taken their eye off the ball. While the FG/FF/SF brigade are a conservative lot at the best of times, it seems that they are allowing the machinations of the Dublin bureaucracy to run the show now – much to their own detriment. The support for medicinal cannabis is overwhelming. When Vera Twomey walked to the Minister’s office in Dublin, form Aghabullogue in Co Cork, she had tremendous support. School children came out and marched with her. School brass bands marched with her. Parents shook her hand. Everyone could see that she was fighting for the good of her child Ava. An honest battle, a humane request. But now Vera, her husband Paul and their 4 children have left Aghabullogue and are living in the Hague in the Netherlands. I spoke with Vera yesterday. She was extremely sad. Not because she has had to move away from Ireland, from her mother and her family. Not because she has been forced to set herself and her family up in a new country and a new culture (they are managing very well thankfully). None of these reasons. Vera, like most Irish people, had faith in the ‘system’. She always reckoned that eventually common sense would prevail and that the political parties who run our country would see the light. Unfortunately she has been betrayed by the same system. 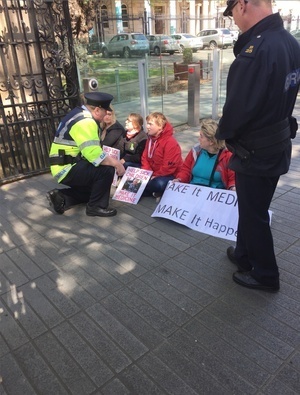 What has brought sadness to Vera was the news that Deputy Gino Kenny’s Medicinal Cannabis Bill was brought to a halt in the Dáil. Despite all the evidence presented to the Health Committee on medicinal cannabis, in face of the fact that country after country are making provision for medicinal cannabis, our TDs and Senators have let Ava and thousands of other Irish citizens down. Those who suffer chronic pain, glaucoma, MS, arthritis, epilepsy and other ailments have been let down. What amazes me is that the political parties have nothing to lose. This is not a contentious issue. Children in national schools have asked me about medicinal cannabis. They can see that it’s a humanitarian issue. How then has this come to such a sorry state? 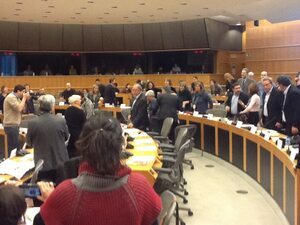 The Minister and the other public representatives have not done their job. They have abdicated their duty to a faceless institution called the Health Products Regulatory Authority (HPRA). We need politicians to represent the people of Ireland. For as long as the Oireachtas is peopled with abdicators it will be a ‘Kip’. Posted in Misc and tagged Luke Ming Flanagan, Vera Twomey at 3:15 pm on July 14, 2017 by Broadsheet. The problem is that there appears to be an innate conservativeness among the regulatory institutions in Ireland. Here in Massachusetts medical marijuana has been available for several years without any issues that I am aware of. Many other states here have also approved it for medical use. Obviously its available in Holland and Germany also, so its hard to see why its such an issue in Ireland. 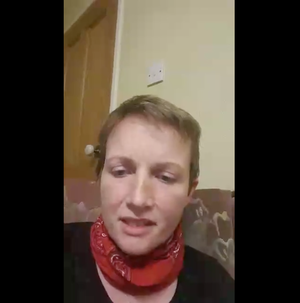 I heard this lady being interviewed yesterday and she said her daughter has gone from having as many as twenty seizures per day to being seizure free for the past nine days. What more do they need. I loved the way our own lawmakers found it “too complex” to formulate legislation for medicinal cannabis – Other countries seem to have the mental brainpower to deal with complex issues, our lads and lassies call it too complex and scrap the bill… If it was a bank needing a bail out or a corporation needing tax shelters we’d have the (I’m assuming) complex legislation in place within days/hours if needed..
They’re two very dedicated parents, doing all this for their child, and children in the state. She’ll be given an award in 30 years, and paraded around by politicians, but god knows what’ll happen to her child, or other kids in the same position. And if she is, I hope she’ll spit in their faces. The woman is a Lioness. I have heard her speak, and was impressed by her passion and determination. As an aside, what of older people like your Sheik, who have quite nasty arthritis and are medically unsuited to nsaids? To old and proud to take to the streets to importune drug dealers we are just to be left in daily pain? I don’t know what is behind Flanaghan’s dig at Sinn Fein. They have supported Vera Twomey all the way and a SF motion supporting her was passed by Tipperary County Council. I’m sorry but I’m not convinced that the far left behind this are doing this for medicinal cannabis users but in fact are doing it for recreational cannabis users. Gino Kenny who is forced to earn over €80K working in a kip says that he regularly smokes a joint. So because Gino likes the odd spliff, those who would truly benefit from it are to be ignored and left without? When there is a genuine, proven use for it? I fail to see what bearing Gino’s personal preferences have on the benefits posed by this bill. Plenty of politicians in the government, and not just on the ‘left’, have proposed bills and legislation which they have had a personal interest in. Conservative ireland is alive and well. Safe little ireland. An insular island with a veneer of progress. Latte in one hand and rosary beads in the other behind he back. And that’s you, with your fear of mother. Mass when you go home for the holidays. Baptizing the baby just for a quiet life. Ryan Tubridy audience of bland alcoholics. Middle of the road and loving it. Racist but causally. we’ll have to see the outcome of an abortion referendum, but i would imagine that if the legislating of medicinal use was put to vote it would pass. You have a nice story though. Nonsense, paps. ‘Gay marriage’ makes us a bastion of modernity and freedom? Think again. Just because you pretend you are living in San Francisco doesn’t mean you are. Ireland is wrapped in rosary beads and will be for decades to come. You have the jeans ironed for Sunday mass? Even Israel was able to manage this one. No one thinks they are weak on law and order. They still managed to legislate for medical marijuana. I couldn’t agree more with Flanagans sentiments.